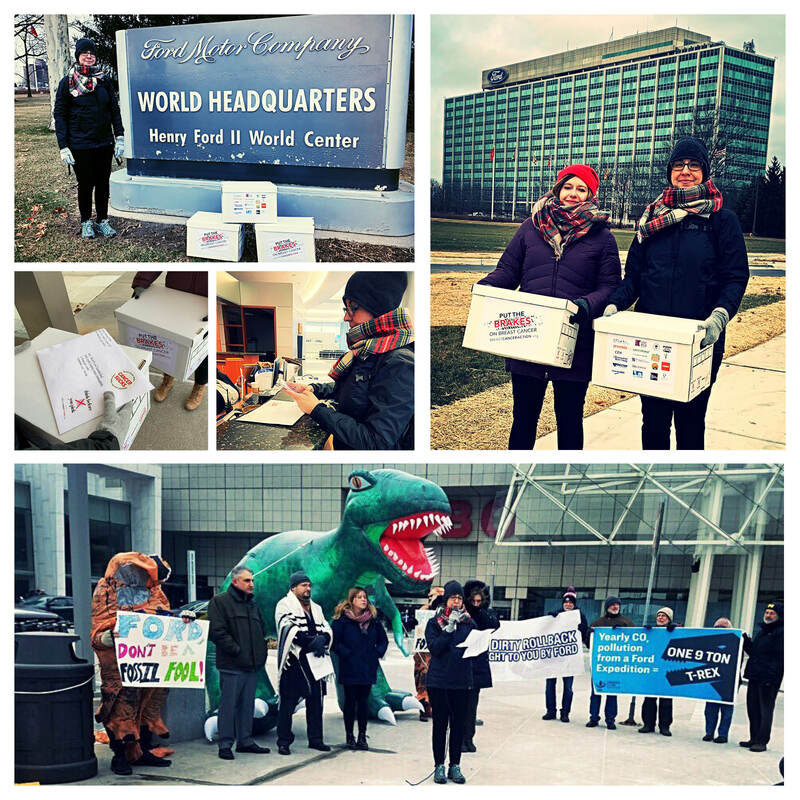 Last week, I was in Detroit putting pressure on Ford Motor Company with a day of action, building on our 2018 Think Before You Pink® campaign, “Put the Brakes on Breast Cancer.” In case you missed our real time reporting on social media, we delivered more than 45,000 petition signatures to Ford’s world headquarters and joined our friends in the Clean Cars Coalition in turning attention to Ford’s hypocrisy during the North American International Auto Show in Detroit. On Thursday morning, I layered up for a day of outdoor ruckus-making because, as a fellow activist noted, “sometimes the resistance is freezing cold”—and so is Detroit in January. We kicked off our day of action at Ford Motor Company’s world headquarters in Dearborn, Michigan. We delivered more than 45,000 petition signatures that our friends at CREDO Action collected from people across the country who joined our call to Ford to “Go Further” than their pinkwashing “Warriors in Pink” program. If Ford really wanted to make a difference in the breast cancer epidemic, the giant automaker who first brought the famous Model-T to the mass market would be a true leader and stop making vehicles that produce cancer causing-exhaust. At noon, I spoke at a press conference outside the auto show at the Cobo Center in downtown Detroit, joining our Clean Cars Coalition partners: Public Citizen, Sierra Club, Interfaith, Power & Light, and Safe Climate Campaign. While our partners pointed out that the annual pollution emitted from the Ford Explorer is said to be 9 tons, the equivalent weight of a T-Rex, I urged Ford to help put the brakes on breast cancer, and to clean up their cars. Watch the press conference below, I speak third (at 8:07). Bill Ford is speaking at the Detroit Auto Show touting his company, which consistently lies about its commitment to the climate. We’re LIVE outside trolling him with a 10 foot TRex.The weight of one T-Rex = the annual pollution emitted from one Ford Expedition. 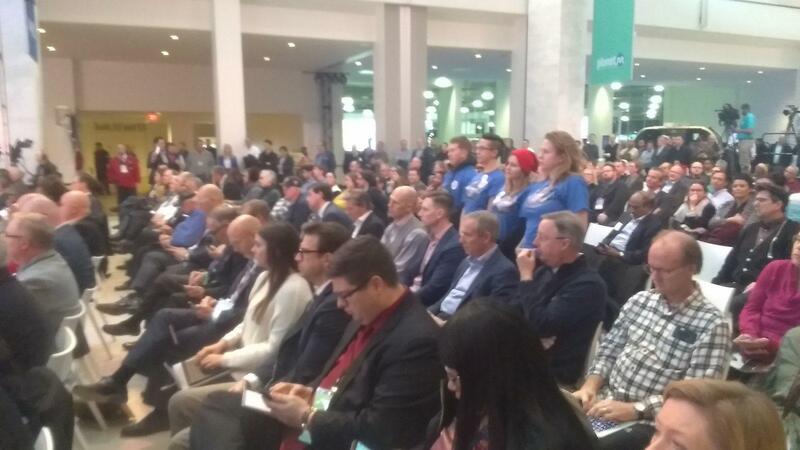 But the day wasn’t over and in the afternoon, I participated in a direct action during Executive Chairman Ford’s speech “The Final Word,” at the auto show. Every time Bill Ford talked about “electrification” or building a better future we stood in protest to let him know weren’t fooled. Standing shoulder to shoulder in protest with our Clean Cars Coalition partners will Bill Ford speaks at the auto show. Last October, tens of thousands of people joined us in telling Ford we’ve had enough of their “Warriors in Pink” program, positive platitudes, and pinkwashing. The campaign was broadly supported by 20 health and environmental justice organizations, all of which endorsed our “Put the Brakes on Breast Cancer” campaign and joined us in calling on Ford to do more. And 46,050 people raised their voices to challenge Ford’s pinkwashing and sent letters to the executives of Ford telling them to help put the brakes on the breast cancer epidemic. Ford tells us they’re “dedicated to helping” those touched by breast cancer for decades. It’s part of the pink smoke screen they use to try and cover up the truth—that the cancer-causing exhaust spewing out of the tailpipes of Ford’s vehicles is actually helping drive up the risk of breast cancer. 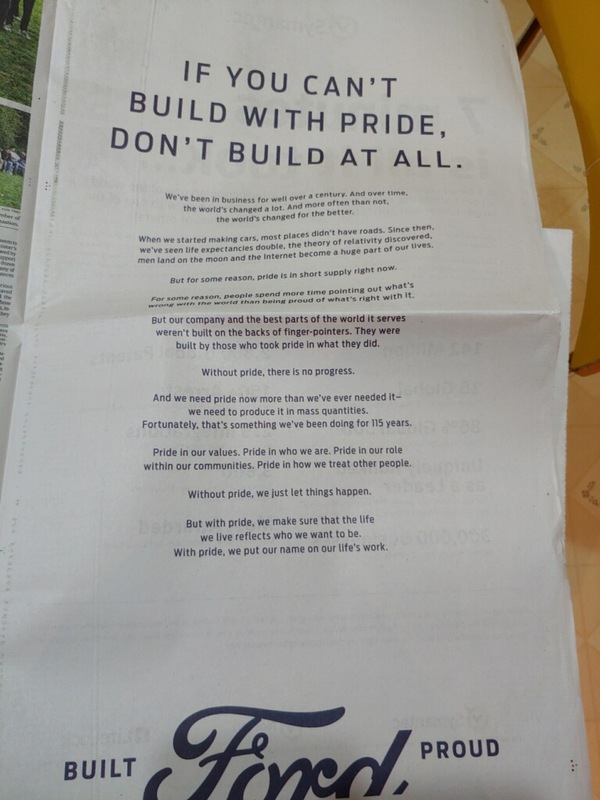 Ford’s clearly feeling the heat, otherwise why would they have purchased a full-page ad in the New York Times in November complaining about people “pointing out what’s wrong with the world” and asserting “pride” is more important because “without pride, there is no progress.” We think Ford should be ashamed of their pinkwashing. Thanks to everyone who spoke up and spoke out against pinkwashing by signing the petition, sending your letter to Ford executives, and joining us in Michigan. 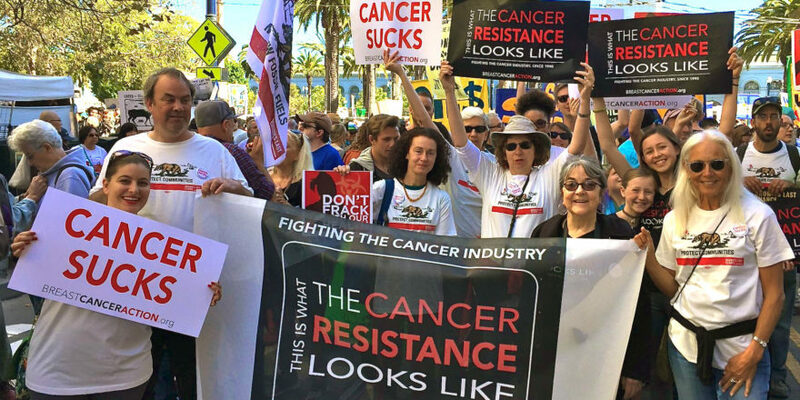 Our health is not for sale, and we’ll continue to keep the pressure on pinkwashers to clean up their act and put our health before corporate profits. This entry was posted in Articles, BCA Events, BCA News.